The words sung by Broken Walls and accompanied by a powerful drumbeat are thundering from the massive speakers in the horse arena serving as concert venue. Colorful Traditional, Fancy, and Feather dancer’s busts into the arena, as hundreds of German’s give rousing applause. 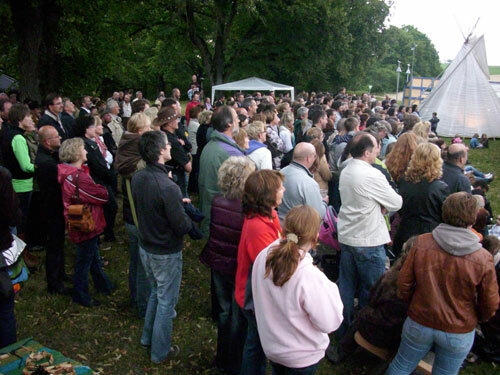 This scene was repeated at several other major venues, often with hundreds of visitors each, coming from near and far to see the “Indianer” from North America. The team performed at churches in Herborn and Altensteig, at City Halls, at a well-known area restaurant, at a “House of Blues,” music pub, a water castle, and various other locations. more contemporary sounds and music of “Broken Walls.” They were not disappointed. 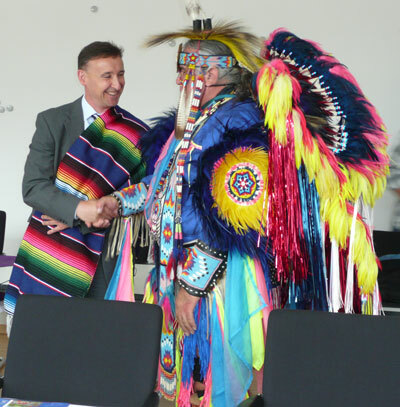 It was evident again that there is great interest in Native people from North America in Germany and all over Europe. But cultural exchange was not the only purpose of the team’s trip to Germany. They also came to share parts of their history, including the often horrendous results of abuse, mistreatment by the majority culture, neglect, alcoholism and drug abuse and the healing that they experienced by coming to know Jesus their Creator in a personal way, helping them overcome devastation and hardships. 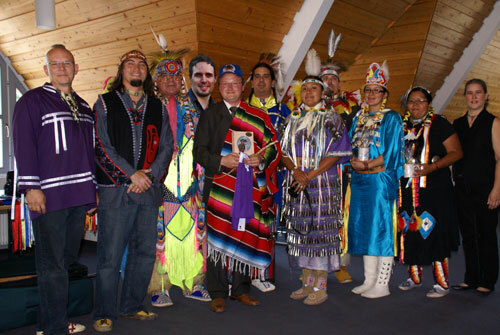 “In the past, First Nations people were either completely assimilated into European culture, or they reacted against it and it’s religion,” said Maracle. “But God didn’t make a mistake when he created our native cultures. Jesus came to conquer sin, not culture. We were made ashamed of our culture. Here are a few reactions the team received. A young lady was moved by the music and dance of the team. Members of the German organizing team are working with her, introducing her to life in fellowship with Jesus and other Followers of Christ. Native team members keep receiving encouraging news via email and facebook about how their lives were changed by the words they shared and the gospel of Jesus Christ. Broken Walls (Jonathan Maracle – Mohawk, Vocals, Guitar, Mohawk Wind flute, Bill Pagaran – Tlingit, Drums, Kris DeLorenzi – Bass, Vocals) For more information about Broken Walls, their music CD’s and DVD and other products here Created to Dance (Robert Soto – Lipan Apache, Fancy Dancer, Homer Hinojosa – Lipan Apache/Cherokee/Blackfoot, Fancy Dancer, Trey Adams – Lipan Apache, Southern Traditional Dancer, Orena Monahan – Quechan, Jingle/Fancy Shawl Dancer, Erika Monaham Quechan, Fancy Shawl Dancer, Chelsea Flores – Lipan Apache, Southern Traditional Dancer) More information about Created to Dance, their music CD’s etc. here This tour was made possible by a very dedicated, generous, and hardworking team of organizers in Germany. We are all very thankful for their vision and tireless work to make it possible for the team to share their culture and faith in Jesus. Warrior, Ride the Wind from YWAM Native Ministries on Vimeo. Dancing for Creator from YWAM Native Ministries on Vimeo. Beautiful Feet from YWAM Native Ministries on Vimeo. Indianweek 2010 Deutschland from YWAM Native Ministries on Vimeo. Really wonderful report! It was special to be able to travel across Germany. It is so encouraging to see how our native heritage has made way for us to carry our message of love to these beautiful people. We look forward to our return someday.. Thanks for this great report! It’s awesome to see what the Lord is doing in Germany through the ministry of Broken Walls and Created to Dance and also our Messianic brother Ted Pierce. God most certainly has great plans for the peoples there.HalleluYah!